Mali Mish - Day 40: A day trip to St. Cloud, Minnesota. We woke up this morning and noticed that a bunch of our dish towels under the sink were soaking wet. No, someone wasn’t feverishly washing dishes and drying them off while we slept. 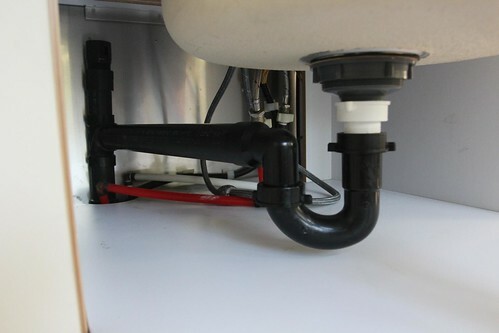 After a closer look, we found that the connection at the upwards portion of the ‘U’ pipe of the sink drain had worked itself loose. Thank God we had those towels there or we might have had a lot more water in hard to clean places. And that, was the most exciting thing we have done for the last 2 days. Well, we are going to change that. After a couple of days of mozying around doing nothing, we are making the short drive north to a college town called Saint Cloud. 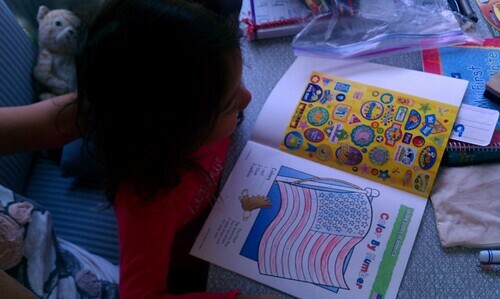 Of course that is after Ava gets a little homeschooling in and got to color the American flag. How appropriate as today is the 11th anniversary of the terror attacks on 9/11. Our first stop in St. 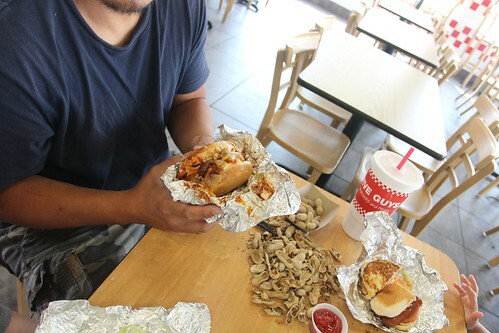 Cloud was lunch at the Five Guys. Our obsession with burgers are continuing. 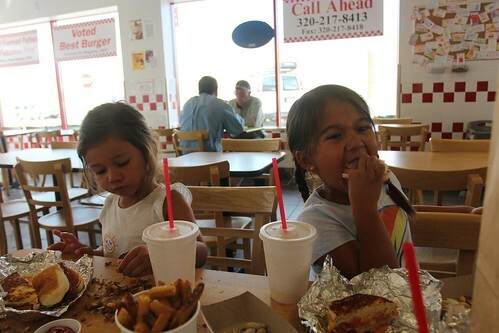 Our first ever experience with Five Guys was in 2010 on Mother’s Day in Savannah, GA. That was before Five Guys started to expand to the west coast and we were pretty impressed by it. Since then, the franchising of the restaurant has caught fire and they are in every corner of every town it seems. Don’t be fooled by this picture, the girls weren’t really into their food. This is one of those ‘right place, right time’ moments when we happen to get the only picture of Ava taking a bite of her hot dog. 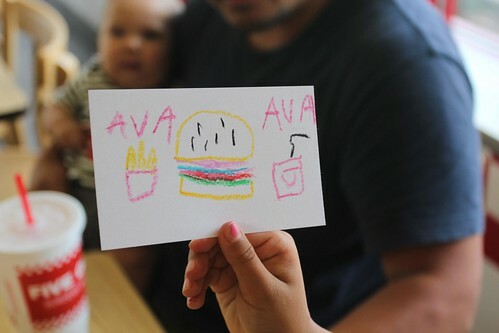 She was more into drawing a picture of her meal. This is her masterpiece of the food she didn’t eat. 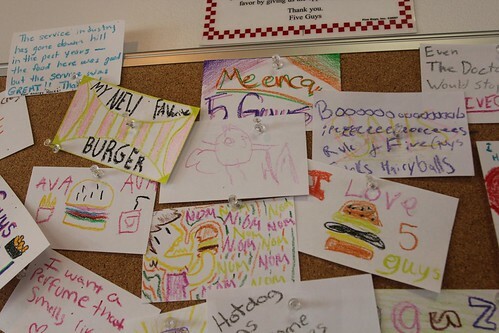 We pinned their artwork on the cork board in the restaurant. 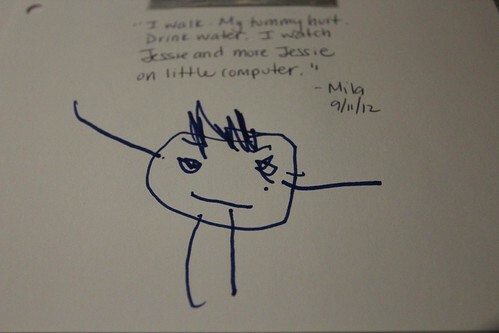 You can see Ava’s on the left side and Mila’s drawing is just to the right and a bit above. Clearly not all of the drawings are made by little kids. At least not the one posted on the other side of Mila’s. 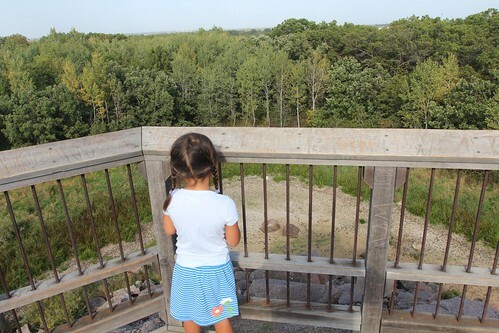 We looked up on Google Maps and just randomly chose something that looked interesting for us to see and what we found was a place called Quarry Park and Nature Preserve. This place was formerly known as “Hundred Acre Quarry”. I gives you an idea of just how large this park is. 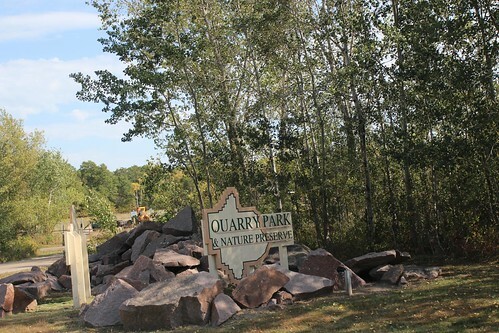 This was a former industry granite quarry that has since been acquired by the Stearns County Park System. 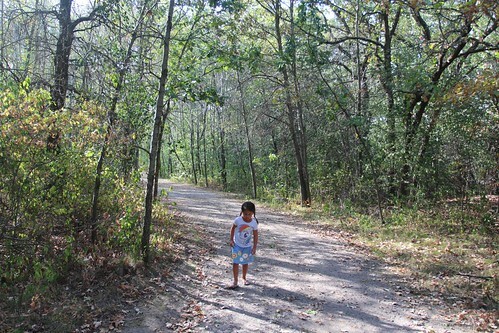 In this 100-acre preserve, there are woodlands, prairies, wetlands and unquarried bedrock areas. 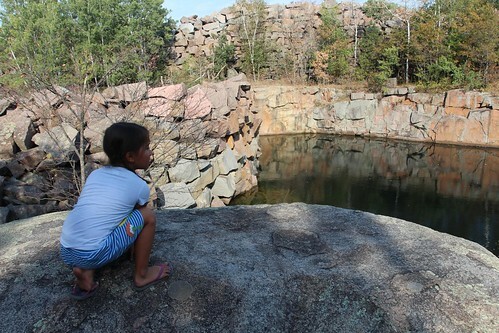 About 30 or so former quarries have since been filled with water and the deepest is an amazing 116 feet deep. Swimming and even scuba diving is permitted in some of them and the water is surprisingly clear. It cost 4 bucks to park for the day and just as we started to wander around the park, the days of skipping afternoon naps finally caught up to Mila. She could not go on and she and Marlene and Luka went back to the parking lot while Ava and I charged on. 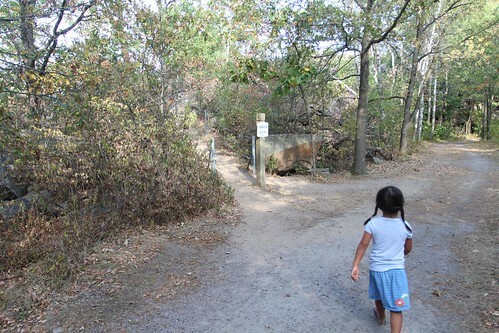 We had two options on our short hike. 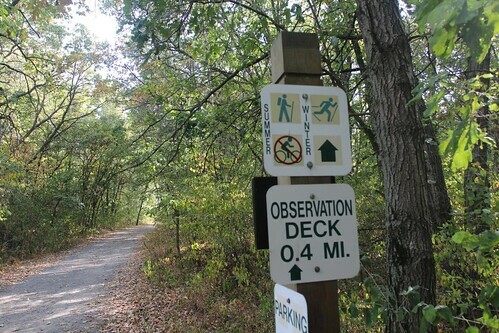 A 0.4 mile walk to the observation deck or a 0.5 mile hike to the swimming hole. 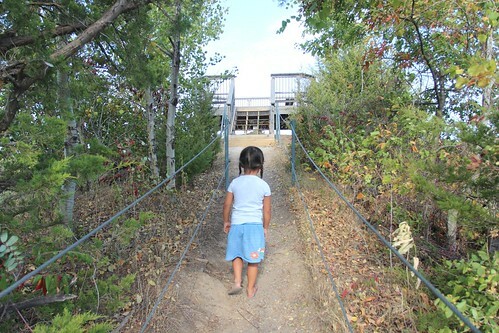 Since we were not prepared with our swimming suits, the observation deck it is. We didn’t really know what to expect at this place and it was actually quite a nice place to be. As we are not typically doing any hiking on our trip, this short jaunt was just about right for us. 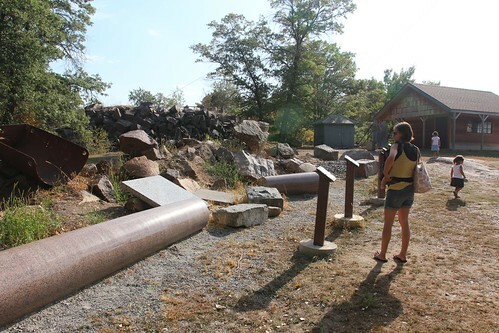 The observation post is just a platform built atop a hill of the granite quarry and we arrived there in no time. This is how we roll. 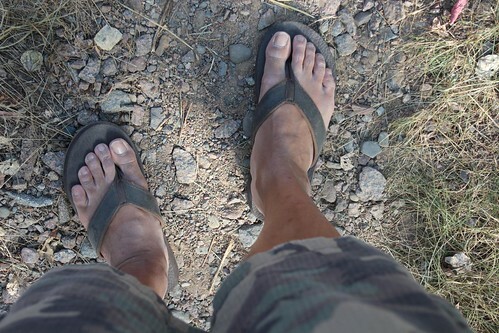 Hiking in flip flops. Let’s just see if the payoff at the top of the deck was worth the walk. I think it isn’t too bad. 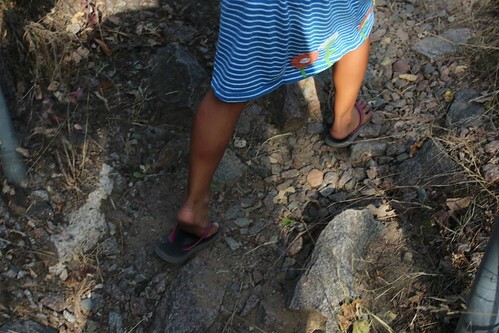 Maybe it is time for Mila to start doing some more hiking on these trips. 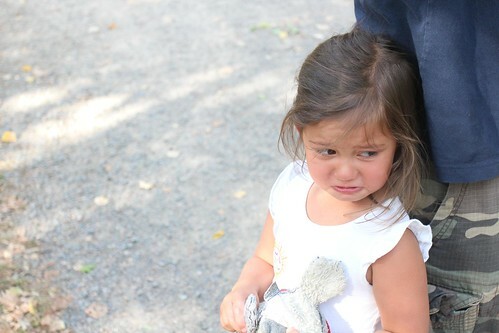 Mila, well, she wrote in her journal today that her tummy hurt from walking. And of course it all got better when she got to watch Toy Story 2 on the little computer.